This got me thinking … do we have something that could clean a phone of germs and bacteria, and do so with limited to no water? 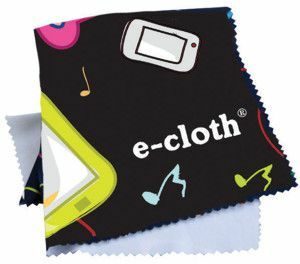 We do, and its called the electronics cleaning cloth from E-Cloth. This microfiber cloth uses NO water to effectively clean your devices from oils, grease, make-up, fingerprints, bacteria, germs and more. How does the E-Cloth work? Thanks to over 3 million fibers per square inch, the microfiber nature of an E-Cloth has the ability to lift and grab all of the filth on our electronics. It’s hard to believe, but it works like a charm. Once you have used the cloth numerous times, simply toss the cloth in with a load of laundry to clean. The absence of water means there is no risk of damaging the screen or the sensitive connections of your device. Works wonderfully for cell phones, Kindles, iPads, tablets, laptops, and GPS.